Finished with a roasted tomato and bell pepper sauce, freshly caught halibut charcoal-grilled atop Peruvian potatoes and lightly filled with a purée of olives and garlic provided the plat de résistance in a meal celebrating three days of terrific sailing and an evening tasting champagnes and sparkling wines. 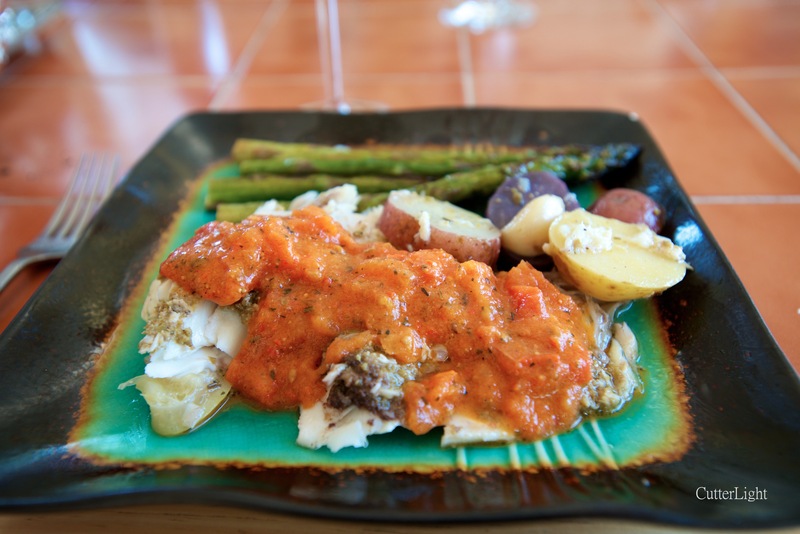 The opportunity to grill and serve a halibut in the whole doesn’t come along every day, particularly in waters where 50-pound fish are more commonly caught than five-pounders. But I could feel the characteristic thumping of a halibut 130 feet below Bandon, and I knew the metal jig I was fishing might have found just the fish we were looking for. Barbra expertly netted the five-pound flatty and everyone aboard gave a little cheer as the first fish of the trip hit Bandon’s decks. 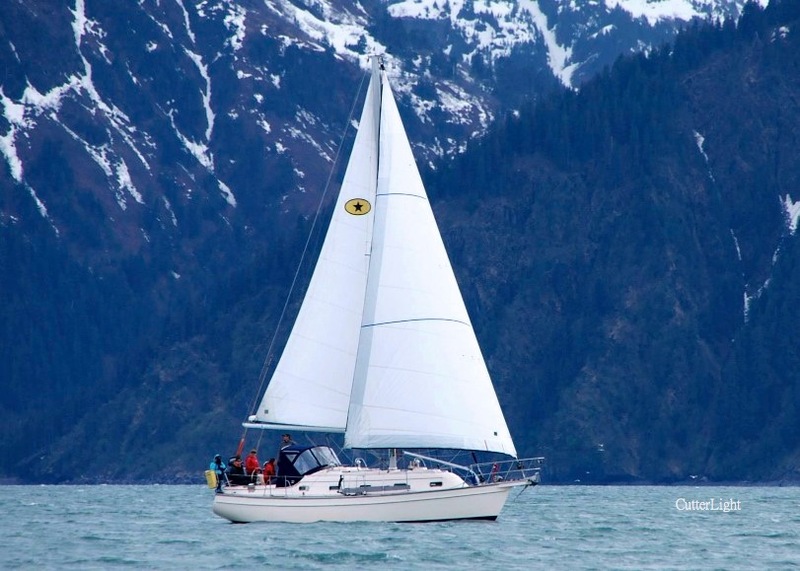 Earlier in the week we did a little casual (very casual) racing in Resurrection Bay. Crew from the sailing vessel Carpe Ventos shared this photo of our Island Packet 350 under sail. We were on our way back to Resurrection Bay after a three-day sojourn around the cape with our friends Krystin and Bixler from Carpe Ventos. The weather had been beautiful and the sightseeing excellent as usual as we encountered seals, sea lions, otters, Dahl porpoises, whales, eagles, oyster catchers, puffins and a dozen other sea birds near Alaska’s mountainous, glacier-scarred shoreline. Right: We grilled our halibut on a deck overlooking Resurrection Bay, but this dish could easily be prepared at anchor on a propane grill. Although we continued fishing (and came back with limits of rockfish as well as a second halibut), we knew we’d already scored the fish we wanted for the centerpiece of an evening in which we planned to sample six different champagnes and sparkling wines – Lesson 7 in the Everyday Guide to Wines course we are taking this summer. A bed of sliced heirloom Peruvian potatoes, herbs de provence, a little Chardonnay, butter, lemon juice and olive oil provided the liquid for steaming this fish. Kept whole, the halibut was essentially filleted without entirely removing the meat from the bones. A thin layer of paste made from puréed olives, olive oil and garlic was spread inside the openings created by the semi-fillet technique as well as in the stomach cavity. After about 40 minutes over fairly low heat on the grill, the halibut was came out flakey, moist and enhanced with a smokey, charcoal flavor. A nice-sized summer flounder from the East Coast or a Japanese hirame would serve equally well, and this dish could easily be prepared in the oven. 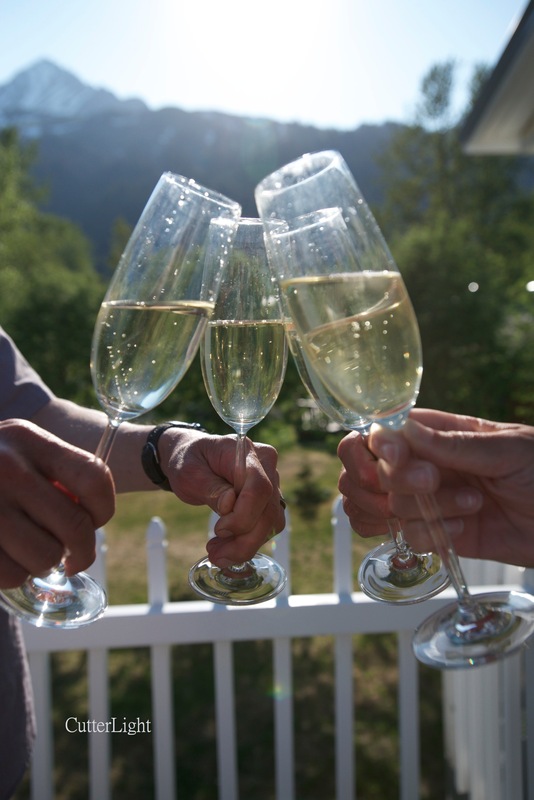 As to the champagne… After years of drinking what we all regarded as fairly good California sparkling wines, all four of us became instant méthode de champenoise fans. With finer bubbles creating an elegant mousse, lots of well-balanced fruit and a toasty, creamy finish, the bottle of Marie Weiss Brut was the perfect wine for this meal. That looks really good to eat and healthy. We love knowing where our fish come from! Thanks for reading! You provide such a beautiful glimpse into Alaskan life . . .
Our boat was having slight overheating issues that we later resolved, so we took out Bandon with Jack and Barbra and succeeded in getting her decks plenty dirty with all the fishing we did. 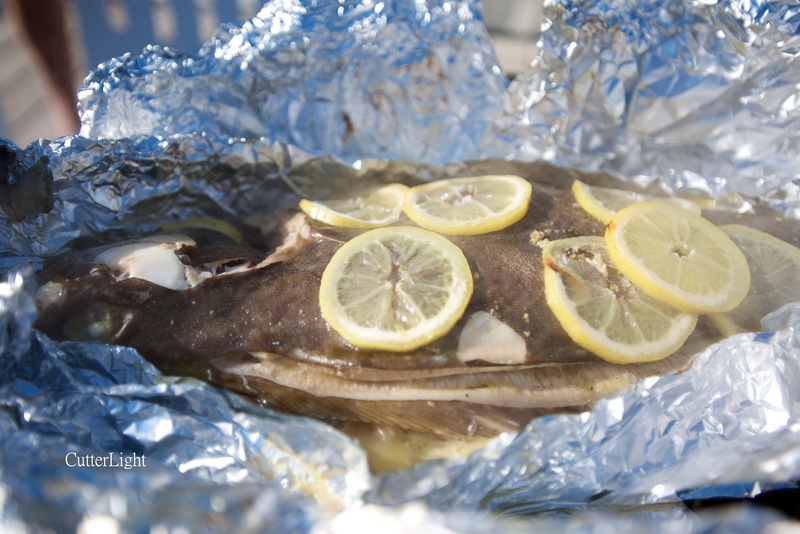 Check out this post on our whole halibut dinner with sparkling wine pairing. 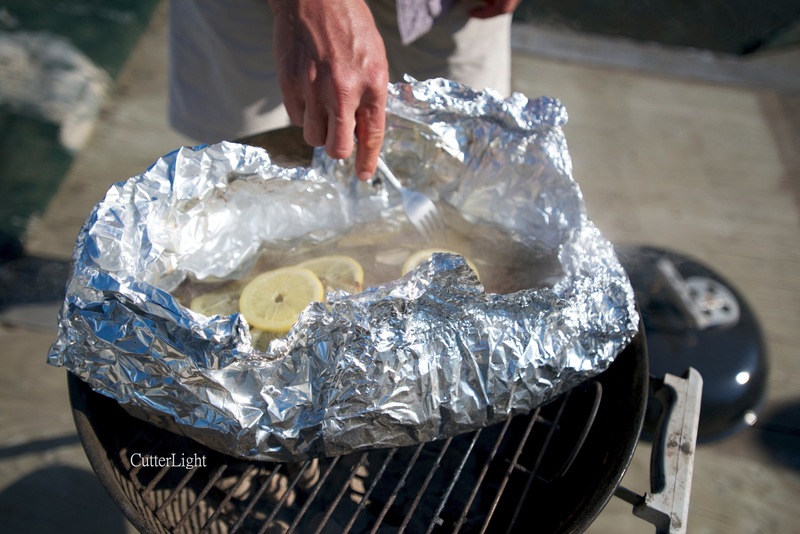 Cooking fish whole on the grill, in foil with lemons, was the way I first learned to cook the fish I caught. This looks great. I’ve only ever had halibut fillets from the grocery. Facts of living landlocked :(. It’s one of our favorite methods. Versatile, too. Thanks for reading! Now I just need to get into the water and restock my halibut supply! Thanks for reading, Janet. We had a good outing for rockfish today – another one of our favorite fish!